Dundee flowers appreciate that saying goodbye to someone is difficult but paying your respects with a funeral tribute is a fitting way to say goodbye to the one you have lost. We have a large option of funeral flowers to chose from and our designs offer a chance to personalise and make this time of sadness filled with beautiful funeral arrangements. Dundee florist can provide any alternative information you may need, if you need to get in touch with us one of our florist would be happy to answer any questions you have regarding funeral flowers. 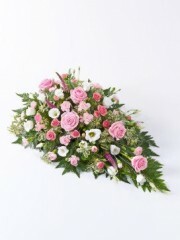 A funeral bouquet is another option, why not browse out sympathy flowers section if Dundee Florists to see if there is anything in that section you think would like. 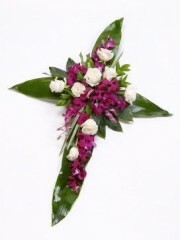 Dundee flowers recommend selecting a colour scheme that you think best suit the deceased, all designs can be altered and tailored to best suit your requirements at Dundee Flowers. As with all of our flowers we can deliver the funeral flowers for you so you can rest assured they will be beautifully put together and then carefully delivered to your place of choice.